Billy Rose (September 6, 1899 – February 10, 1966) was an American theatrical showman. He composed over 50 hit songs. He also gave generously to charities, although tended to flaunt this. He owned the Ziegfeld and the Billy Rose theaters on Broadway and also wrote a syndicated column which ran in more than 200 newspapers. A prudent investor, he was the largest single stockholder in AT&T and in the New York Central Railroad. Most of his fortune was gifted to the Israel Museum in Jerusalem upon his death. The theater collection at the New York Public Library is named after him in recognition of a gift from his estate. His flamboyance may detract from his philanthropy but he appears to have genuinely wanted to lighten people's lives through song and drama and to make theater related knowledge freely available to the public through his gift to the New York Library. His autobiography, Wine, Women and Words contained illustrations by Salvador Dali. Raised in poverty, he perhaps wanted to add joy to other people's lives, and to demonstrate through his acts of charity that anyone could overcome adversity to become successful. Born William Samuel Rosenberg to a Jewish family in New York City, he began his career as a stenographic clerk to Bernard Baruch of the War Industries Board during World War I. Later, due to his great love of music, he became a lyricist. In this role, he is best known as the credited writer or co-writer of the lyrics to "Me and My Shadow," "Great Day" (with Edward Eliscu), "Does the Spearmint Lose Its Flavor on the Bedpost Overnight" (with Marty Bloom), "I Found a Million Dollar Baby" (with Mort Dixon), and "It's Only a Paper Moon" (with E. Y. Harburg). It is said that he sometimes made minor changes to his co-writer's words but these so improved the lyrics that he was sometimes given full credit. He also had a knack for publicizing his material. He went on to become a Broadway producer, and a theater/nightclub owner. In June 1934, he opened The Billy Rose Music Hall at 52nd and Broadway in New York, with the first Benny Goodman Orchestra. He produced "Jumbo," starring Jimmy Durante at the New York Hippodrome Theatre. For Fort Worth Frontier Days, he constructed the huge elaborate dinner theater, "Casa Manana," featuring stripper Sally Rand and the world's largest revolving stage. He presented a show at the Great Lakes Exposition in Cleveland, Ohio, in 1936, which featured the Aquacade, a floating amphitheater water ballet and hundreds of swimmers, including Johny Weissmuller. He had a flair for the spectacular. Rose was diminutive in stature. When he attended a show, his practice was to book four seats: One for himself, one for his date, and the two in front of those so he would have an unobstructed view. In 1938, he opened "Billy Rose's Diamond Horseshoe" nightclub in New York City, in the basement of the Paramount Hotel off Times Square. It initially opened with a version of his Fort Worth show. The Diamond Horseshoe operated under that name until 1951. At the 1939 New York World's Fair, Billy Rose's Aquacade starred Olympian Eleanor Holm in what the fair program called "a brilliant girl show of spectacular size and content." He married Holm shortly after divorcing his first wife, comedian Fanny Brice. Future MGM star Esther Williams and Tarzan star Johnny Weissmuller were both Aquacade headliners. Following the Fair, Rose asked John Murray Anderson, who had staged the Aquacade, to recommend a choreographer for a new show at the Horseshoe. Anderson recommended Gene Kelly, then performing in William Saroyan's One for the Money. In 1943, he produced Carmen Jones with an all-black cast. An adaptation of Georges Bizet's opera Carmen, the story was transplanted to World War II America by lyricist and librettist Oscar Hammerstein II. It was an instant hit. The New York Telegraph called it "far and away the best show in New York," the New York Times said it was "beautifully done…just call it wonderful." The New York Herald Tribune said that Oscar Hammerstein II "must be considered one of the greatest librettists of our day" and that Carmen Jones was "a masterly tour de force." It was made into a motion picture in 1954, for which Dorothy Dandridge received an Academy Award nomination. 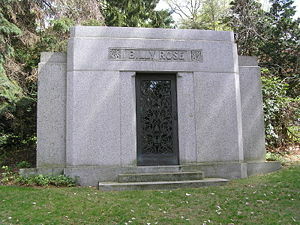 Billy Rose founded the Billy Rose Sculpture Garden in Jerusalem, through a generous donation in his will (contested by his former wives and other family members) and also bequeathed a substantial gift to the New York Public Library, who named their theater collection in his honor. Rose died in 1966, in New York City, aged 66. At the time of his death, his fortune was estimated at about 42 million dollars, which he left entirely to a foundation named after him, disowning both of his sisters. He is interred at Westchester Hills Cemetery in Hastings-on-Hudson, Westchester County, New York. Ziegfeld Follies of 1934 (1934)—revue—featured lyricist for "Soul Saving Sadie," "Suddenly," "Countess Dubinsky," and "Sarah, the Sunshine Girl"
Ain't Misbehavin' (1978)—revue—featured lyricist for "I've Got a Feeling I'm Falling" from "Applause"
Big Deal (1986)—musical—featured lyricist for "Me and My Shadow"
Fosse (1999)—revue—featured lyricist for "Dancin' Dan (Me and My Shadow)"
From 1949 until 1955, Rose was the owner/operator of the Ziegfeld Theatre. During that time, the theater housed four musicals and five plays. From 1959 until his death in 1966, he was also the owner/operator of the Billy Rose Theater. During that time the theater housed four plays, one musical, one revue, three ballets, and twenty-nine concert performances. After his death, the theater retained its name, and remained in the ownership if his estate until 1978, when it was renamed. Today it is the Nederlander Theater, currently housing Rent. Rose was a popular Broadway lyricist in his time. He was known for his work on several plays. His work was highly acclaimed during the era. Rose penned the lyrics to popular songs, as well. He also ran various nightclubs. These were likewise very popular and successful. Interestingly, most of Rose's lyrical credits were collaborations. Biographer Earl Conrad said, "Nobody clearly knew what he wrote or didn't write…Publishers tend to credit him with writing the songs known to bear his name as a lyricist…But tales rumble on…that Billy could feed and toss in a remark and monkey around, but that others did most of the writing." Lyricists might have been willing to tolerate a Rose credit grab because Rose was very successful at promoting "his" songs. Conrad, Earl. Billy Rose, Manhattan Primitive. New York: World Publishing Company, 1968. Jones, Jan. Billy Rose Presents Casa Mañana. Fort Worth, TX: TCU Press, 1999. Rose, Billy and Salvador Dalí. Wine, Women, and Words. New York: Simon & Schuster, 1948. This page was last modified on 8 June 2016, at 15:23.